Whole Os is a delightfully simple blend of brown rice and corn, lightly toasted and transformed into tasty little hoops that couldn't be crunchier. Our cereals are naturally high in fibre and low in saturated fat, always organic and have no artificial additives - because we think our ingredients taste amazing, just as they are. The certified-organic ingredients inside our cereal have been grown in harmony with nature, reducing exposure to toxic synthetic chemicals and GMOs. It's the positive choice for our bodies and for our planet. Following a gluten- or dairy- free diet doesn't mean you have to compromise on taste. Not only is Whole Os fully certified by Coeliac UK and The Vegan Society, it's full of flavour and irresistibly crunchy too. 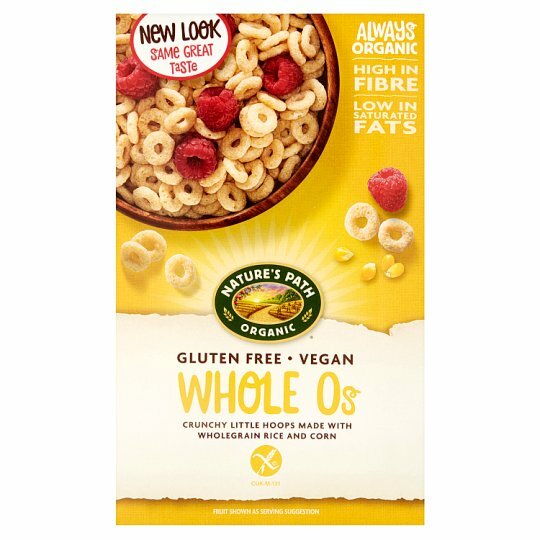 Made with toasted brown rice and yellow corn, Whole Os is a tasty cereal that's naturally low in saturated fat and bursting with fibre. "Our Always Organic Promise goes back to the family farm I was raised on - well before the organic 'industry' began. In 1985, my wife Ratana and I founded Nature's Path Organic Foods based on my dad's advice to 'Always leave the soil better than you found it' by farming without chemical pesticides, fertilisers or GMOs. For over 30 years, our family has aspired to make delicious organic foods and an enduring independent company that you can love and trust." Love Whole Os? Give Mesa Sunrise a try! "Always leave the soil better than you found it." Pack is sold by weight not volume. Settling of contents may occur during transit. Store in a dry place, See top of pack for best before date. Our quality is guaranteed so if you're less than thrilled with this cereal we want to know. Please send the box top with date code to us.